Discount parking near Hilton Garden Inn New York/West 35th Street is available at the following Parking.com locations. 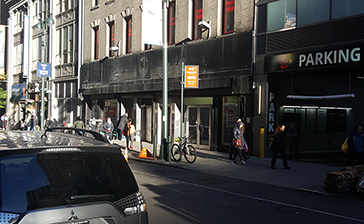 Click on a parking location listed below to print a NYC parking coupon for a discount parking rate for any 6, 12, or 24 hours. The Hilton Garden Inn is located in Midtown Manhattan and nearby Jacob K. Javits Convention Center, Madison Square Garden, Empire State Building, Times Square, and the Broadway Theater District. Hilton Garden Inn New York/West 35th Street is offering Parking.com customers 10% off the best available rate, for a limited time only. Please call 1-877-STAY-HGI and request Plan Code CD to book this discounted offer.